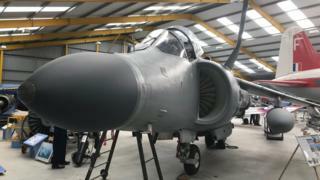 The 50th anniversary of a revolutionary aircraft has been marked at an event in Nottinghamshire. The Harrier jump jet, which was the first vertical take-off aircraft in the world, first came into British military service in 1969. Much of the work to develop it was carried out in the county, with it earning the nickname The Flying Bedstead because of its unusual shape. Harrier Day at Newark Air Museum celebrated the connections the aircraft has to the county. Retired military icons: The ultimate boys' toys?